FILE - Kevin Spacey arrives at the 71st annual Tony Awards at Radio City Music Hall in New York. The suspension of filming on House of Cards Tuesday in response to allegations that star Kevin Spacey made sexual advances on a teen boy is a rare move in an industry that puts commerce first. And hours after news broke about the allegations against Spacey, Netflix said it was pulling the plug on House of Cards, though the streaming network said the decision was made before the BuzzFeed News report on Spacey over the weekend. The network has not commented on plans for a Gore Vidal biopic starring Spacey that is currently in production. The widespread tumult has prompted unusual actions — such as Weinstein being booted from industry organizations — and created a climate of uncertainty. But a look back shows that Hollywood has dealt with disruption before, with even beloved shows and actors fighting to keep their balance amid controversy. Lucille Ball, right, and Desi Arnaz star as Lucy and Ricky Ricardo in the TV series "I Love Lucy". During Hollywood's 1950s "red scare," Brooks said, I Love Lucy star Lucille Ball was accused of being a communist sympathizer. The sitcom co-starred her husband, Desi Arnaz, who took action. 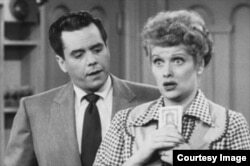 "Desi came out before a studio taping and said, 'The only thing red about Lucy is her hair, and that's not real,"' using humor to effectively defuse the situation, Brooks said. The show's No. 1 status also helped. FILE - Stacey Keach arrives at the 2013 AFI Fest premiere of "Nebraska" at the TCL Chinese Theatre in Los Angeles, Nov. 11, 2013. Popularity and audience acceptance of a star's personal issues aided Mickey Spillane's Mike Hammer when lead actor Stacey Keach served six months in jail for a drug-related arrest in England in the mid-1980s. The 1984-85 season was cut short, but the series resumed in 1986 with Keach aboard and aired until 1987 on CBS. FILE - Isaiah Washington holds the award for outstanding actor in a drama series for his work on "Grey's Anatomy" at the 38th NAACP Image Awards in Los Angeles, March 2, 2007. Grey's Anatomy was swamped by controversy in late 2006 when an on-set scuffle broke out between stars Patrick Dempsey and Isaiah Washington over Washington's use of a gay slur regarding another cast member. "If they like him, if they get along with him, it's easy enough to say, 'If I don't get my career ruined in this, I'll stick with him,"' he said. FILE - This image released by Netflix shows Robin Wright as Claire Underwood, left, and Kevin Spacey as Francis Underwood in a scene from "House of Cards." Netflix and House of Cards producer Media Rights Capital had already decided to end the series at the end of next season, its sixth, but on Tuesday they chose to pause the production, which is filmed in Baltimore, "to give us time to review the current situation and to address any concerns of our cast and crew." Spacey was not scheduled to work that day. The move comes after actor Anthony Rapp came forward with claims Spacey made inappropriate sexual advances toward him in 1986, when Rapp was 14. 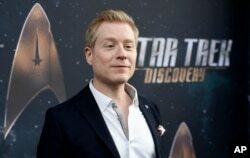 FILE - Anthony Rapp, cast member in "Star Trek: Discovery," poses at the premiere of the television series in Los Angeles, Sept. 19, 2017. The fallout for Spacey also included the loss of an award he was going to get later this month by The International Academy of Television Arts & Sciences. The group says "it will not honor Kevin Spacey with the 2017 International Emmy Founders Award," which is to honor "an individual who crosses cultural boundaries to touch humanity." Spacey was to get it at a gala on Nov. 20 in New York City. Past recipients include Rhimes, Steven Spielberg and J.J. Abrams. A release date for the final House of Cards episodes has yet to be announced. Netflix is developing a possible spinoff of the award-winning drama that helped put the streaming service on the TV series map.